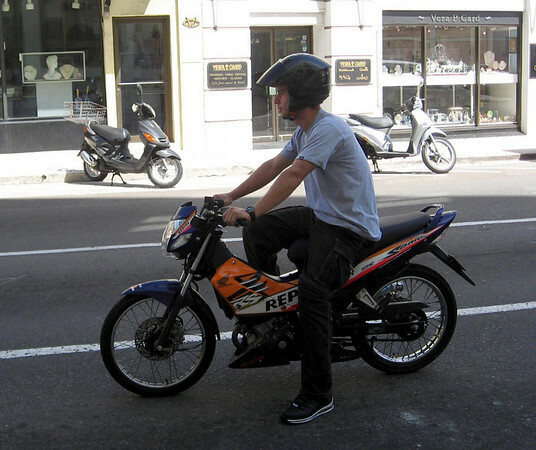 I spotted this guy on a cool Repsol Edition Honda Sonic 125 while in Bermuda. Bermuda has an island wide speed limit of 30mph and a motorcycle displacement limit of 150ccs. Importing vehicles and the price of oil/gasoline on the little island must be a small fortune. No doubt this must have helped to shape these restrictions. Though they are catching on, why aren’t scooters more popular in major metropolitan cities of the US? Around the world motorcycles and scooters are utility vehicles – much less pleasure vehicles. They provide cheap gas-sipping easy transport. Why don’t more Americans want that? Scooters – They aren’t just for King Wah’s Dragon Noodle anymore!